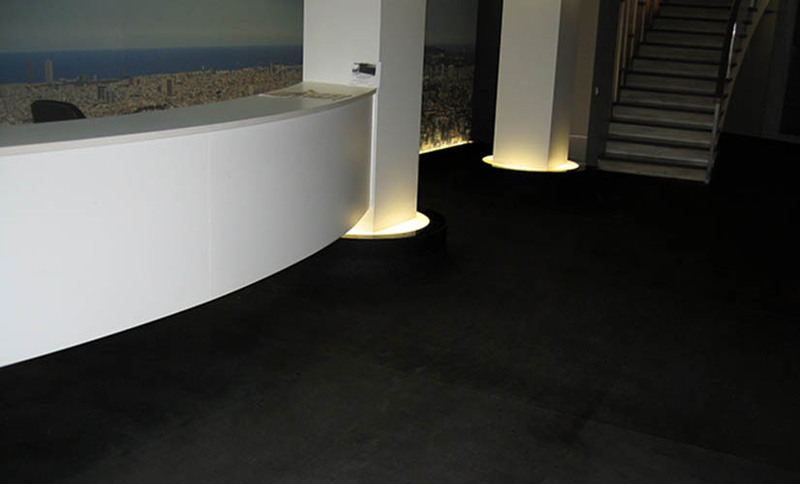 Safe S Top is a range of flexible anti-slip vinyl floor coverings. The 0,7mm PVC wear layer is embedded with carborandum (silicon carbide) and ceramics particles, which confer slip resistance and durability to the flooring. This anty-slyp flooring is reinforced with a fiber glass grid for a higher dimensional stability. The PVC backing enables an excellent bonding. Safe S Top includes the Supraclean® treatment for an easier maintenance. It also wears a fungistatic and anti-bacterial treatment for a perfect hygiene. It is appropriate for all heavy traffic areas where walking safely is a must: industrial kitchens, elderly residences. Also for buses, elevators, cloak rooms, access ramps, shops, bars etc. This vinyl slip resistant flooring responds to the highest criteria when it comes to heavy traffic and resistance to slipperiness. Suitable for industrial kitchens, cafeteria, etc. 6 soft colors and 2mm thickness. This vinyl slip resistant flooring responds to the highest criteria when it comes to heavy traffic and resistance to slipperiness. Appropriate for industrial kitchens, cafeteria, etc. 9 soft colors and 2mm thickness. Our anti-slip floorings Safe S Top have to be glued on a dry and even surface with a water-based acrylic adhesive. In case of humidity in the sub-floor, a bi-component PU adhesive can be used. The joints can be heat-welded with a welding rod. In order to offer an easier and cheaper maintenance, our vinyl floorings Safe S Top are protected with the Supraclean® treatment. The pores of the floorings are sealed, avoiding the dirt to penetrate. Safe S Top must be cleaned with a neutral detergent for vinyl floorings (Dr. Schutz, Ecolab, Johnson). The cleaning can be made either manually or with a rotative cleaning machine.